August 27, 2013 CAIRO (AP) — Security officials say the son of an outspoken Muslim Brotherhood figure has been detained. Mohamed Soltan’s family says he is a U.S. citizen and does not know his whereabouts. An active supporter of the Islamist group online, the 25-year-old had posted pictures of his arm after it was shot when security forces cleared out two Brotherhood sit-ins Aug. 14. The Ohio State University graduate is the son of outspoken Muslim Brotherhood figure Salah Soltan. He was detained Monday along with four other men in the office of the pro-Brotherhood Rassd Network News service, according to security officials who spoke anonymously in line with regulations and released the information to The Associated Press late that same night. A blog called causingfitna has documented the Mohamed Soltan’s support for Hamas and the Muslim Brotherhood while he was living in the US. Dr. Salah Sultan (aka Salah Soltan) was educated at Dar al-Ulum in Egypt where Hasan El-Banna, the founder of the Muslim Brotherhood, and key Brotherhood ideologue Sayyid Qutb also graduated. From 1998 until 2007, Dr. Sultan was resident in the US where he held several positions in US Muslim Brotherhood organizations including serving as a member of the Fiqh Council of North America (FCNA) and as founder and President of the Islamic American University (IAU) closely associated with the Muslim American Society (MAS). Dr. Sultan left the US following negative press reports about his extremist statements which led the authorities there to suspend his application for American citizenship. He relocated to Bahrain where he was appointed as adviser to the head of the Supreme Council for Islamic Affairs. At some point, likely following the ascendance of the Muslim Brotherhood, he relocated again, this time to Egypt where in October 2012, he was appointed Secretary General of the Egyptian Supreme Council for Islamic Affairs (SCIF). When Global Muslim Brotherhood leader Youssef Qaradawi visited Gaza in May 2013, Dr. Sultan was at his side when Qaradawi was greeted by the Hamas Prime Minister and called immediately for “Jihad to death” against Israel. Dr. Sultan’s resume has expressed his vision for himself as “To live happily. To die as a martyr.” Dr. Soltan is a member of the International Union of Muslim Scholars (IUMS), headed by Qaradawi. 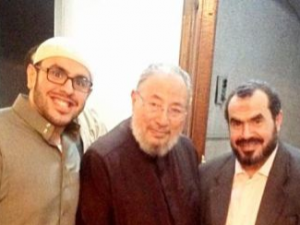 Dr. Soltan’s virulent anti-Semitism was extensively covered in a post from July as part of a series on the visit of an IUMS member and associate of Qaradawi’s to the US White House.